Wibu-Systems is one of the twenty-one companies whose track record of innovation has gained official recognition at the recent “100 locations for Industrie 4.0 in Baden Wuerttemberg” ceremony in Stuttgart, Germany. The Alliance Industrie 4.0 of Baden-Wuerttemberg, Germany, celebrated the top avant-garde enterprises for their ingenious solutions in the realm of Industrie 4.0. With their successful implementations, the winners have displayed superior inventiveness and proved the concrete relevance of their technologies for the evolution of truly connected industry. 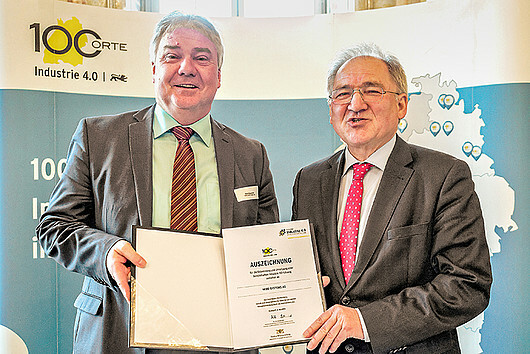 Baden-Wuerttemberg’s Secretary of State Peter Hofelich personally handed over the award to the Industrie 4.0 champions and underlined their exemplary contributions to the economy of the German state. Wibu-Systems has excelled with CodeMeter®, its versatile solution for software protection against piracy and reverse engineering, security against tampering and cyber-attacks, and licensing as a business revenue multiplier. The flexibility of this solution is best expressed by its 3D platform independence: the licensed software can run on any cyber-physical device, including PCs, mobile devices, embedded systems, PLCs, and microcontrollers; it is integrated with all major operating systems used in the automation arena, such as Windows Embedded, Linux Embedded, VxWorks, QNX and PLCs like CODESYS; and it supports a matchless lineup of secure elements that spans across dongles, memory cards, TPMs, or cloud and software-based repositories. At the recent Hannover Messe, Wibu-Systems showed a typical application of CodeMeter, where its top encryption technology, combined with a secure hardware repository, protected the software running on an embroidery machine as well as the complete set of production data (customers’ details, proprietary designs, production volumes). But CodeMeter is also already safeguarding railway control systems, retail banking machines, medical appliances, and automotive assembly lines, to name just a few use cases. Oliver Winzenried, CEO and co-founder of Wibu-Systems, states: “We are proud to be recognized as one of the major stakeholders facilitating the transition of small and medium companies to the industry of the future. Security is the cornerstone of the new industrial revolution, and with CodeMeter, we are providing a pragmatic answer both in terms of technology and monetization opportunities”.